My knitting had been going in fits and starts. I love knitting and it's something that I sometimes just need to do. I love the feel of the yarn and needles in my hands. I knit all year long, not subscribing to the idea that people don't knit in the summer months. While I don't knit an afghan that's going to drape over my lap as I work on it, I do continue to knit in July! A lot of times in the summer I'll work on knitted jewelry, either fiber or wire. In fact, wire knitting is a great way to get a knitting fix in the summer. Anyway, I hadn't done much knitting this past fall. I knitted a cute little beanie hat for my daughter for her Christmas stocking and started another Bohemian scarf which didn't get very far. But, once the holidays were over I wanted to knit a birthday present for my friend Kathy. She's a January baby like I am. So, I decided on a scarf from the book Scarf Style. I had made this scarf for myself several years ago out of a drapey yarn. 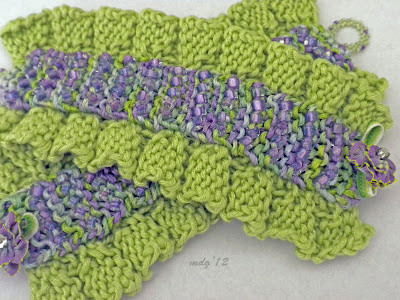 This time I used Cascade 220 in a luscious lavendar shade. Kathy loved the scarf. Unfortunately, we've had a crazy warm winter, so she's lamenting the fact that she can't wear it much! Take a look at the finished product. Love those swirls! I decided to add the tassels at the ends for two reasons. First, because I love tassels and second because I wanted to add beads to the necks of them. It's difficult to see in the photo but once I had completed the tassels I buttonhole stitched around them incorporating beads in the same color into each stitch. I was so pleased that Kathy liked the scarf. I wanted to make her something that she wouldn't make for herself. The next knitted project is one I designed myself. I keep seeing fabric cuffs in different magazines and catalogs and I decided to design a knitted pair. I wanted to incorporate beads, of course. For some reason I thought a pair would be cool! Here is what I came up with. 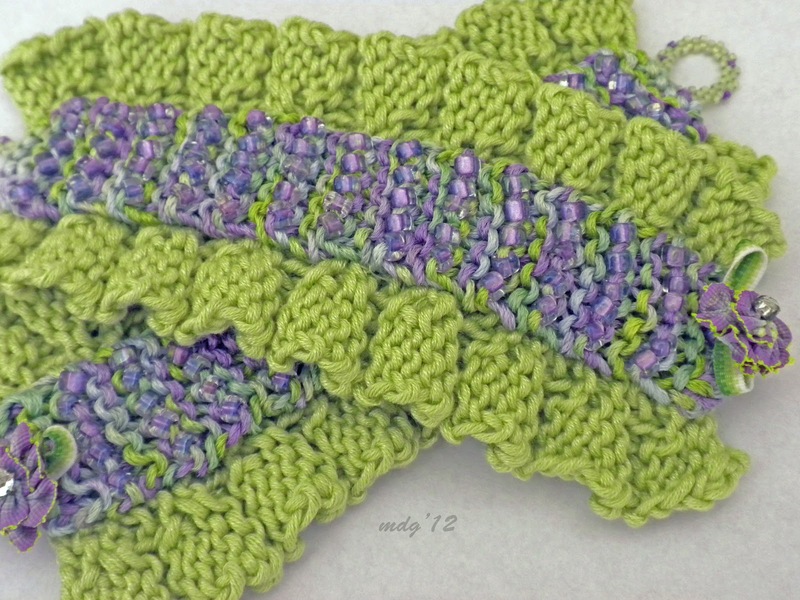 I knitted two sections of a pleat stitch and joined the ends. I then knitted a beaded band in a varigated silk and attached that to cover the seam. I had two adorable vintage looking ribbon posies with rhinestone centers that I used for a button and I peyoted a loop on the other side. They're fun little spring accessories in my favorite spring colors. For my birthday my son and daughter-in-law sent me one of the knitting books on my Amazon wishlist and it has some great fingerless gloves, or mitts, in it. I love knitting, and wearing, fingerless mitts! I'm finishing up the first pair now and I'm going to start the second pair, which are beaded (! ), this weekend. After that, maybe I'll get back to that Bohemian scarf that I put aside in the fall. The scarf and cuffs are very pretty I love the colors you used. Knitting is something I have not learned to do. I LOVE that blue scarf! That has a beautiful drape to it! I have always wanted to learn to knit...it is in the category "crafts I want to do before I die"! I do crochet, but not as often as I would like to! This is some serious cute knitting, love it. The blue scarf is truly a work of art and in my book looks like "Soft Jewelry".